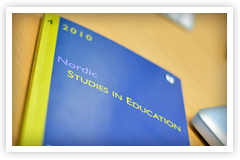 NFPF/NERA, the main association for educational researchers in the Nordic countries. - Possibilities to participate and organise activities within our networks. - Membership of European Educational Research Association (EERA) with a reduced fee at the annual ECER conference. We need your input and ideas! We call upon you to attend the General Annual Meeting / Annual Delegates’ Assembly at the NERA conference in Uppsala, because we have some very serious matters concerning NERA’s economy and the future of our journal, Nordic Studies in Education (NSE) on the agenda. The Annual General Meeting will take place Thursday 7/3, 12.45–14.15 in Bertil Hammersalen, Blåsenhus. Since we cannot obtain support for the journal from Nordic Publication Support (NoP) from 2019 onwards, unless we make it an Open Access journal, we will no longer be able to publish the journal unless we find funding elsewhere. Going Open Access would mean that we can no longer receive subscription fees. The Board has dealt intensely with the issue throughout 2018. 1. We shall have to raise the NERA member and conference fees in order to cover the shortfall in funding for NSE. 2. We shall have to introduce APC (Article Processing Charge), which means that authors of articles will have to pay for having the article published. If we choose APC only, the price for an article may be around 10.000 – 15.000 NOK. Some universities pay for this, others do not. It is more common in Norway and Finland than in Denmark, Sweden and Iceland. 3. We shall have to find alternative funding, which may be possible, but not easy in a time where public institutions are under tight financial rule. 4. We need to change publisher, if we find a more profitable agreement with another publishing company than Universitetsforlaget. Depending upon offers this could mean that we may not be able to keep the journal open for articles in English as well as Scandinavian languages, but possibly only in English. 5. Or are we arriving at a situation where we may have to realize that NERA may no longer be able to carry the financial responsibility of publishing NSE? 6. We appreciate suggestions if you have other options. We ask you to reflect upon this issue and bring your ideas to the meeting, as the NERA Board is in urgent need of input in order to proceed on this delicate issue. At the meeting there will be time for an open discussion (issue 10). The NERA Board will discuss this issue at the Board meeting 5/3, and continue the discussion at the meeting 8/3. This means that the Board can take the opinions raised during the Annual Delegates’ Assembly into account. Networks that have sent in an annual report to the NERA board can apply for support for networks activities. There is 30 000 NOK in the 2018-budget for support to networks. The applications must be submitted by the convener of the network to the chair of the NERA board, Anna Slotte, by August 1st, 2018. Please use the application form at Application for NERA network support.